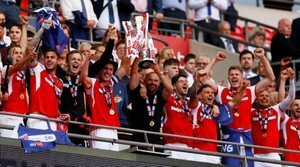 This time in six weeks a lot of us will be arriving at Griffin Park to watch Rotherham United’s first game back in the Championship after a year in League One – something, I think if we are being honest, most of us wouldn’t have thought would happen. So what will be happening with the Millers in those six weeks? We have various local pre-season games to play as well as a visit from newly promoted former Miller Neil Warnock who is bringing his Cardiff City boys to the New York Stadium on a Wednesday night in July followed by a trip to Field Mill to take on Mansfield Town. There’s also a week’s pre-season training camp in Austria in July. After it being hailed a big success last year, Millers Boss Paul Warne decided to do the same again with it involving a lot of running up and down hills. The Millers will be training at the Lindabrunn Sportschule and have two games against local sides penciled in, though nothing has been confirmed as yet. The players have another week before they return to training with Warney saying he is hoping to have strengthened the squad for that return so everyone can start together the pre-season together. He’s also said in the media that he is getting a player in on loan whose parent club have told him he will be here for pre-season. The extra three weeks in the play-offs have probably held proceedings up although looking at the transfers that have been made there haven’t been that many as yet. One thing we do know is that Rotherham United Chairman Tony Stewart will have money available for new players and another thing we can also be certain of is that it will be spent wisely.